Well established in the Southern Nicoya region of Costa Rica on the Pacific Coast and the Gulf of Nicoya, Nativa Realty Costa Rica Ltda. is the real estate company of choice where integrity, confidentiality and honesty are top priorities when assisting their clientele. 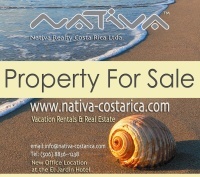 Nativa Realty offers properties in Costa Rica for sale with the best value and highest quality including newly built residential homes, luxury homes and estates, prime raw land home sites with ocean views or mountain views, beach front properties as well as turn-key commercial opportunities. Nativa Realty’s listings cover many popular beach towns along the Pacific Coast of Costa Rica, but our special focus is on the Southern Nicoya Peninsula. Nativa Realty has now added a rental department to meet your needs to relax and enjoy in the Southern Nicoya as you search for your dream property… or simply just come to relax in tropical paradise. Please visit: www.malpais-beach-rentals.com for more information. With an office base in the Southern Nicoya region as well as strong business ties with a carefully selected team of Real Estate professionals throughout the country, Nativa Realty is able to provide a top quality real estate buying experience for the most savvy investor. Furthermore, our recommended attorneys have an in-depth understanding of foreign investment in Costa Rica and can assist with company formation and answer any questions you have about offshore investment. Our deep roots in the region have enabled us to join forces with a local network of architects, builders and development planners to ensure confidence in our clients that their dream home or development project can become a reality, on time and within budget. Whether you are looking for an investment with significant appreciation, an income producing property, a vacation home, or a combination thereof, we are here to assist you!